Tired of the endless string of mass shootings? Tired of being told after the mass shootings that “now isn’t the time to turn this into a political issue?” Tired of your Congress not representing you on this issue? Well, let’s do something then. In 2010, The NRA had over $243,000,000 in expenditures. The largest spending gun control advocacy non-profit that year had just over $3,000,000 in expenditures. (Source: The Washington Post). Quite simply, our representatives in Congress are bought and paid for by the NRA. This is why there is no movement on gun control in this country. There are approximately 325,000,000 people living in the United States right now. 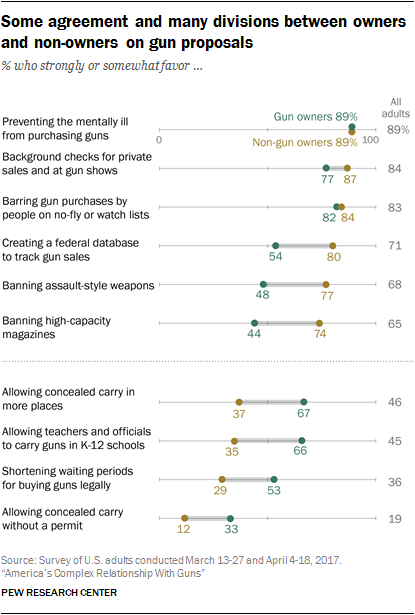 If we start with the 68% who favor banning assault-style weapons, that’s 221,000,000 people. If each of those 221,000,000 donated $2 to a gun-control advocacy group, that group would receive over $400,000,000. And now you have a more level playing field. Obviously, not everyone can afford to donate. But for those of you who can, if you want to put an end to this senseless tragedy that has become commonplace in this country, please make a donation to an organization that will advocate and your behalf.